THPBlog: Green Diamond Resource Company to clearcut log trees up to 84” dbh just south of Redwood National Park. 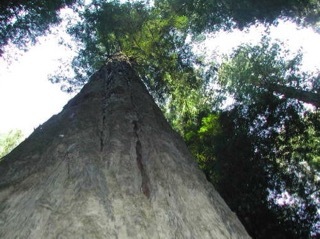 Green Diamond Resource Company to clearcut log trees up to 84” dbh just south of Redwood National Park. This THP is about 12 miles NE of Trinidad, CA and Highway 101 and just south of Redwood National Park (unit E is adjacent). Units B, C, D and E are directly across Coyote Creek and visible from the Lyons Ranch Trail parking lot on Redwood National Park lands. The THP area flows into Redwood Creek which is listed as an impaired watershed for sediment and temperature. Green Diamond Resource Company is planning a mostly clearcut tractor and cable logging operation on steep and unstable slopes in Douglas fir, redwood and western hemlock forests at an elevation of 1,240 to 2,400 feet. There are multiple road failure sites including fill failures, cut bank failures, road bed slumping and 10 unstable areas including 5 shallow rapid landslides, 4 dormant landslides and 1 large erosional feature in unit A. Units A and B have trees up to 60" dbh, and unit E has trees up to 84" dbh. A special treatment area will be created to hide the effects of clearcutting between unit E and the boundary of Redwood National Park. 23 road drainage sites are planned for work including rocking, dip construction, ditch cleaning, culvert repair/replacement and restoration of washed out crossings. There is marbled murrelet habitat on Redwood National Park lands over 1 mile west and NW of the THP area, and southern torrent salamanders are known to occur in or around class II (mid sized) watercourses in unit E. Spotted owl nesting territories are located within .25 miles of units C and E, and within .5 mile of unit D.